KS.CRM Core Framework is a modular Customer-Relationship-Management System, completely written in C#/DotNet for the Microsoft SQL-Server. It works with the free SQL-Server Express version, not included in this setup. The program offers 4 different caching strategies which make it suitable for different environments: starting from a small local database with just a few users up to a huge enterprise database with hundreds or more users. Select the strategy in the program under menu Extras->Options. KS.CRM uses the latest database technologies such as async parallel data access through Multiple Active Result Sets (MARS). KS.CRM is Ready for the Cloud, you could host the SQL Server somewhere on the net, or you could use Microsoft Azure Cloud SQL-Database as the service-provider for your database. But you are not bound to it, at the end you decide if you'd like to host your data somewhere or drive your own SQL Server. 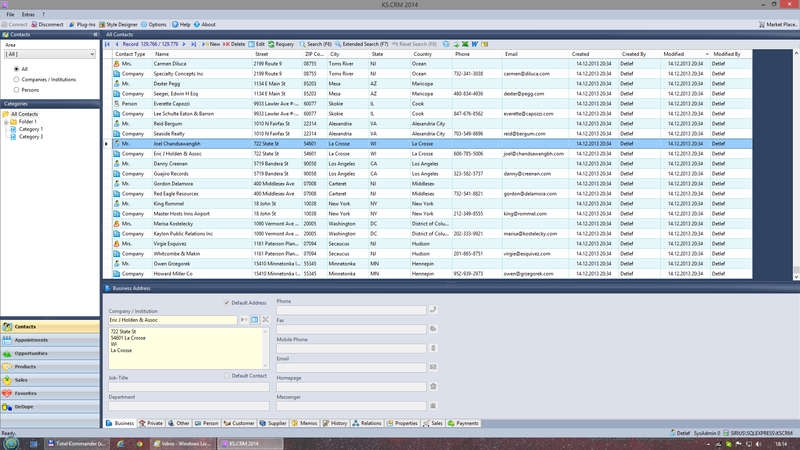 KS.CRM Core Framework is free to use without charge and without any limitations. Import from many data sources. 32-bit launcher for 32 bit data sources. Super fast import using the BulkCopy provider. Chunked to minimize memory usage. This is the main application as shown above. This download is real FreeWare which never expires. No nag-screens and no advertising. Install the Microsoft SQL-Server, the free Express-Version is enough. The program leads you through the setup of the database on the server. Log in as a user that has enough rights to create a new database. Some sample data for testing can be found here. We'd like to support you with the installation if you have any questions. If you have problems installing the database or accessing the SQL-Server, we would like to help. Most questions regarding connection problems are answered in this blog. The PlugIn SDK allows the development of new plug-ins. The Source-Code License offers you the complete sources of the core application and all PlugIns, that belong to the core, PlugIn SDK included. If you have good ideas, but no money at all, please ask for a free SDK license. Why reinventing the wheel? You can start with a well designed and proven concept where you add new features with minimal effort. You and your clients can save time and money. Your customers benefit from a consecutive development of the core application and can add more PlugIns, when available. High security is not only demanded in administration, military or medical services, etc. As a general business you will benefit from having the full sources of the application, with wich you work everyday and which you commit your critical data. It's always good to know, that you are completely independent from a special vendor and that you could maintain this application on your own, when needed. So you are always on the save side when deciding for the source-code license. The Software-Development-Kit allows you to create, publish and sell your own Plug-In's for KS.CRM. Includes the C# sources of the main application and of all PlugIns/DLL's that are part of the Core Framework. This license also includes a Plug-In SDK license. 'KS' is an abbreviation for 'Kroll-Software', what just means, that this is a CRM made by Kroll-Software. It shouldn't be confused with other CRM's from other vendors, who accidentally have a similar name. Software directories are welcome. Download the kscrm_pad.xml file for this product.